What would the world be like if famous killers and monsters from horror cinema were real? What if Jason Voorhees really killed all of those frisky camp counselors? What if Michael Myers really came back to kill his sister in the town of Haddonfield, PA? What if Freddy Kruger could really invade your dreams and kill you while you sleep? Behind the Mask is set in a world where all of these occurrences happened. Leslie Vernon, the main protagonist of the film, is inspired by these classic slashers and killers. This is a twisted ride into the life of a rookie slasher. A camera crew is given a "behind the scenes" look into Leslie Vernon's life. They will walk and stalk with this crazed madman who is, in turn, being hunted by his own doctor Doc Halloran (Robert Englund) who wants to see an end to Leslie's killings. This movie is one of the most creative looks into the horror genre I have ever seen. The movie goes everywhere and references tons of horror films. The movie switches between documentary footage and regular slasher horror movie footage. It really works in some places, except for the showdown scene, it just kind of jerks you out of the experience. The movie also screams "Spinal-Tap" to me and I was waiting the entire film for Leslie to get lost under a stage in Colorado somewhere (It was Colorado, right?). 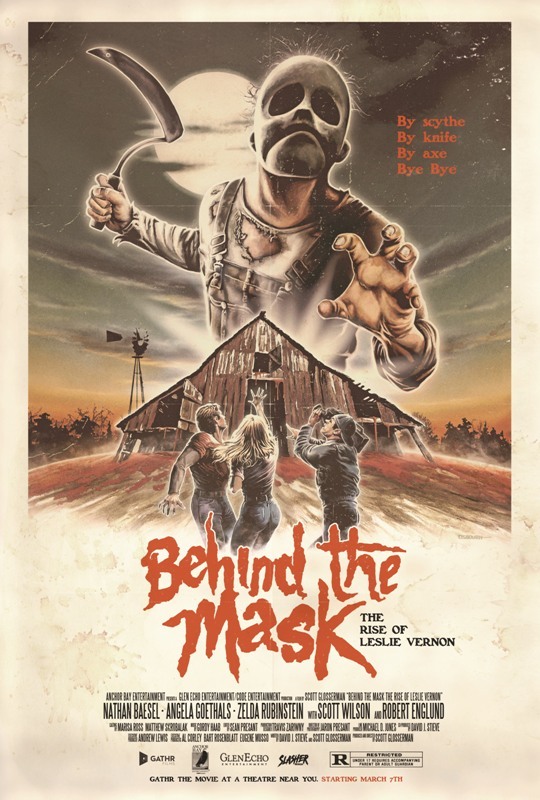 So, in closing I think that if you like Spinal-Tap, Halloween, and Cloverfield-type first-person camera movies you will really enjoy Behind the Mask: The Rise of Leslie Vernon. I am sure that you will enjoy the unique plot of the movie over the actual horror content. I am giving this movie a 7 of 10. "Plants and turtles. I only keep pets I can eat"